Pneumatic positioners are used with rotary air actuators to accurately position control valves used in throttling applications. These valve positioners convert a 3-15 PSI input control signal to a proportional pneumatic output. This output is fed to an air actuator which in turn controls the valve position and flow (combined with mechanical feedback). Air actuated valves with positioners have a history of rugged and reliable service in tough applications. Valworx positioners offer fast and accurate control of ball valves, butterfly valves and other type valves. These positioners direct mount to rotary type air actuators with the standard VDI / VDE-3845 Namur style top shaft mounting. Universal Namur mounting bracket kit is included with each positioner. 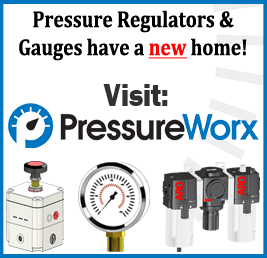 Suitable for use with Valworx double acting or spring return air actuated valves, as well as most other brands utilizing the standard Namur mount. Rugged aluminum die cast housing has superior anti-corrosion surface treatment and an easy read visual valve position indicator. Easy to adjust zero and span. 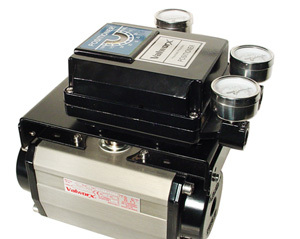 Positioner is PRE-INSTALLED when ordered with a Valworx air actuated valve package.